You clicked on the DS32 fixed head disk drive in the picture. The DF32 Disk File and Control is a fixed head hard drive with a total capacity of 32K 12 bit words. It can have up to 3 DS32 Extender Disks slaved off of it for a total system capacity of 131,072 words. This was normally used with the earlier machines, the PDP-8, PDP-8/S, or PDP-8/I. All the units I have are made with the older R series logic which is a diode transistor logic (DTL) made with discrete diodes and transistors. The later units were made with the standard TTL IC M series logic for use with positive bus PDP-8/I's. The DF32 was attached to the computer through the 3-cycle data break interface via 11 to 13 cables. The 3-cycle data break was a type of direct memory access (DMA). 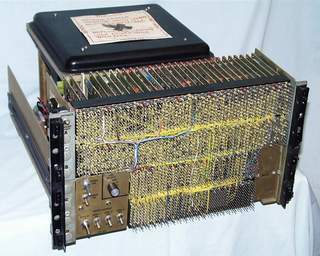 The processor wrote to various registers in the DF32 to setup the transfer then the unit transferred the data while the processor was able to do other things. The 3-cycles used were to increment the word count memory location in PDP-8 memory,fetch and increment the current address memory location, and then read/write the word from the peripheral to the memory location specified by the current address. When the word count reached zero word count overflow signal was generated to let the peripheral know that all words have been transferred. This method saved logic in the peripheral since the memory address and word count stored in the PDP-8 memory would take twelve cards to store in the peripheral. The drive hardware did not organize the disk into fixed size sectors, each word on the disk was capable of being read or written independently with a maximum of 4096 words in one transfer. Recording Method Non-Return to Zero Inhibit (NRZI). Recording Media Nickel-cobalt plated aluminum disk 10"x1/4"
The DF32A/DS32A which operated off of 50 Hz power rotated slower so data transfer was 80 microseconds and average access time was 20 milliseconds. Since the heads land on the disk when the power is removed it was recommended to not power down the drive motor any more than absolutely necessary. Recently (2012) I attempted to restore another DF32 that came with my straight 8. First step was to clean. See the straight 8 restoration for my cleaning methods. On the previous drive when I removing the platter to clean it the head/track alignment seemed to get a little off making recovery of the contents on drive difficult. For this one I tried cleaning the platter installed on this drive. I put alcohol pads between the heads and the platter and then rotated the platter and then pulled the pads out to clean the heads. The platter on the top had corrosion dots where the aluminum platter corroded and pushed up the plating. The bottom seemed to have some also since it pulled on the alcohol pads when the disk was turned. After a couple turns it seemed to knock loose most of the material that was pulling on the pads. I replaced the foam seal around the covers with weatherstripping from the hardware store. I hooked up the scope to the read amplifiers and spun up the drive. There was some noise from the platter damage but it didn't seem like anything really bad was happening so I continued. One of the W532's was bad so I swapped in another W532 until I can repair it. I did manage to capture most of the data using my scope as shown in the pictures and directory listing below. The disk platter has too much corrosion to be usable though. The disk contained an earlier version of Disk Monitor System than the paper tapes I have. Nothing on the drive was worthwhile enough to spend more effort trying to recover the spots where the signal had dropouts. It may be possible to have the platter re-plated or a new one manufactured but I suspect the cost would be significant. I am using the drive with my DS32 emulator board for now.